“Your bed is in Railey.” I was stunned why the bed I got is on a peninsula away from Krabi. The staff of Pop-in Hostel wasn’t joking based on his expressions. He noticed the uncertainties visible on my face. He just laughed, apologized, and told me that the rooms in the hostel are labeled with famous islands and beaches in southern Thailand. What a funny arrival! I made my way to Railey just across Phi Phi Island, both on the first floor of the building. It’s a 6-bed mixed dorm room and I was fortunate to be accommodated on a lower bunk. An English guy was the only guest in the room when I settled my stuff. Some getting to know spiel and he assured he had a great time on Pop-in Hostel’s Sunset Kayaking Tour that the hostel crew offered me on my arrival. 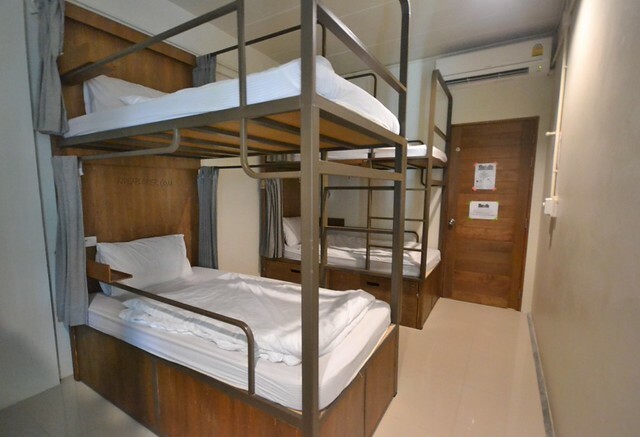 Three double-deck bunks occupy the room with a meter away from each other. Each bed has its own curtain to cover from the pervasive lights when someone arrives at wee times of the evening and brave enough to turn the lights on. 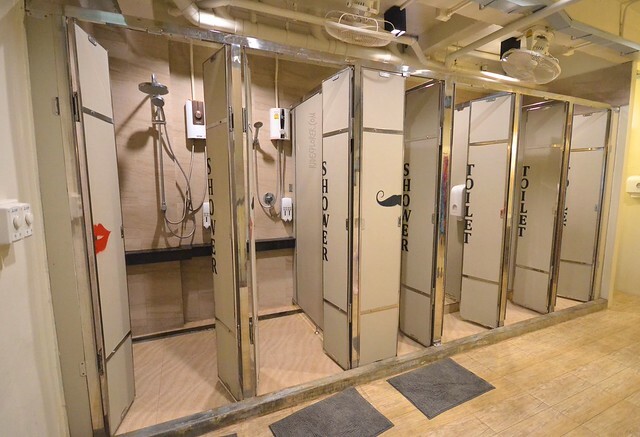 Lockers are on the bottom of the bunks on pull-out cabinet type. Mattresses are not that super massive but soft enough to rest those worn-out muscles. Each bed is also equipped with own reading light, a small box for tiny stuff, and a universal power plug. A regular-sized pillow and fleece blanket complete the sleeping amenities. 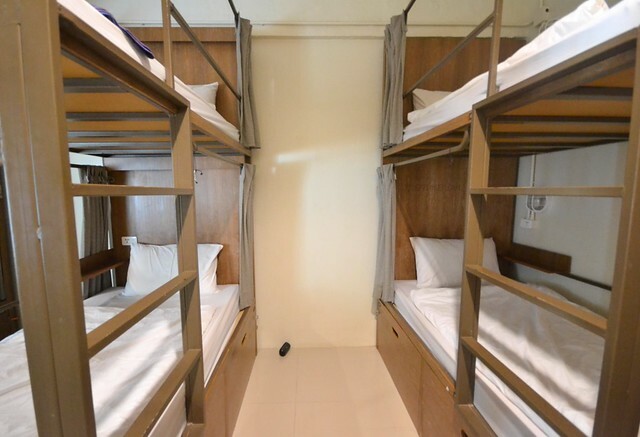 Other islands in the hostel are Phi Phi Island, Jum and Tub Islands, Poda, Hong, Pakbia, Bamboo, Lanta, and the bays of Maya, Pi Leh, and Monkey. 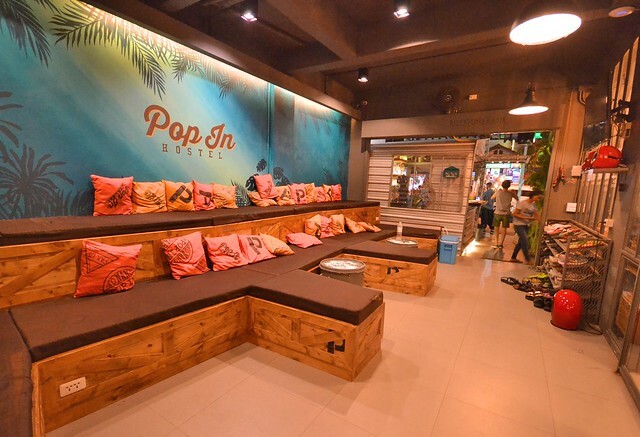 If you have limited time in southern Thailand but wanted to visit as many islands as possible, stay at Pop-in Hostel. Just kidding. I wasn’t able to check if every floor has a common shower but on our floor, there are six cubicles; three for toilet and others for shower. There’s also a separate corner for male urinals. Hot and cold shower available in hand-held and overhead spouts while shampoo and shower gel are available. You can have a fresh towel for THB200 deposit. 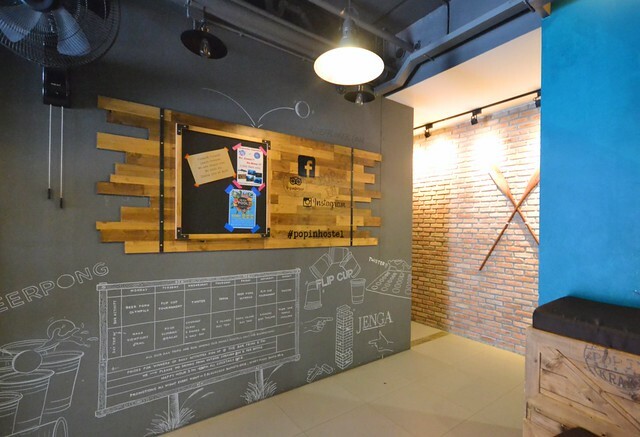 Reception area of Pop-in Hostel is dominated by wood from tables, cabinets, stools, and racks filled with tourism promotions. The hostel also sells their brand’s merchandise like tank tops and t-shirts. If you stay for five nights, you get a free one. If it’s too long for you, you can have one for only THB199. 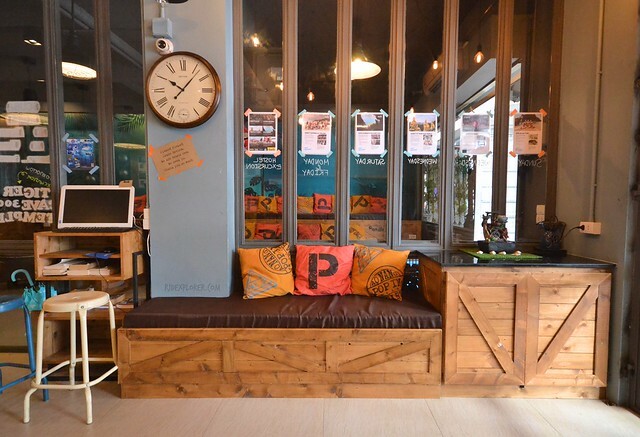 Separated by a sliding door, from the reception, is Pop-in Hostel’s common lounge more vibrant than its tropical theme. Bright orange and yellow pillows dot the couch designed to look like wooden crates. The wallpaper bears the hostel brand and leaves of trees under the palm family. 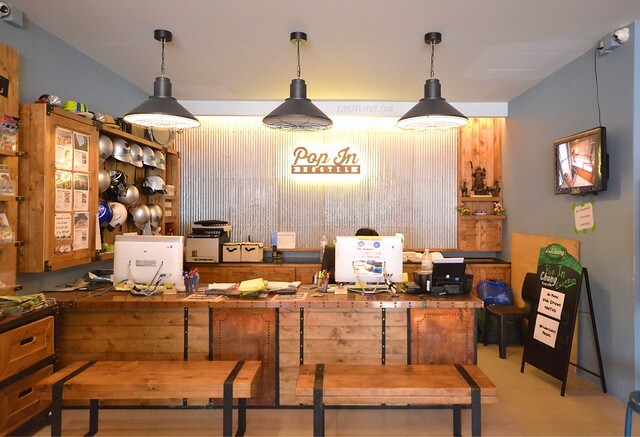 Pop-in Hostel, together with their circle of hostels in Krabi; Pak-up Hostel and Balcony Party Hostel, organize tours for their guests. These include sunset kayaking in Ao Thalene, sunset at Tiger Cave Temple, and Hong Island hopping. Added activities are rock-climbing in Railay Beach and the famous Ao Nang Pub Crawl. Befriend her because she’s in charge for the free bbq! Upon check-in, the hostel crew will also hand you vouchers for your free barbecue. Yes, you are entitled to two free barbecues every night! The barbecue station, right next to the bar counter, starts to distribute smoky grilled meat and vegetables around 7 PM. When the sun disappears from the horizon, the hostel’s frontage transforms into a party place. 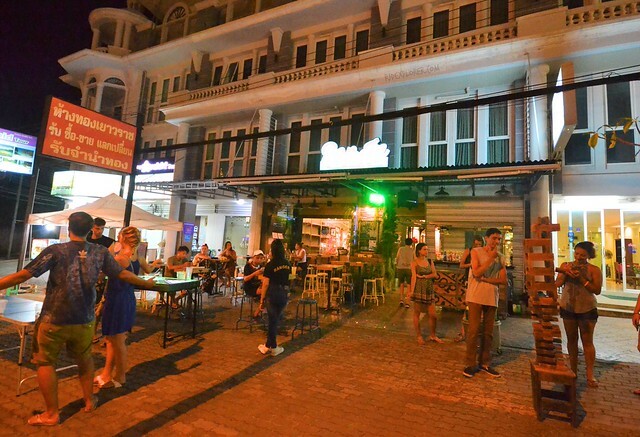 Beer pong tables, giant Jenga blocks, and party music draw hostel guests and passersby to join the fun and craze. I saw a breakfast advertised on few bond papers on the walls near the stairs but found to be unavailable during my stay. Not an issue because a strip of restaurants offering different cuisines is right in the neighborhood. 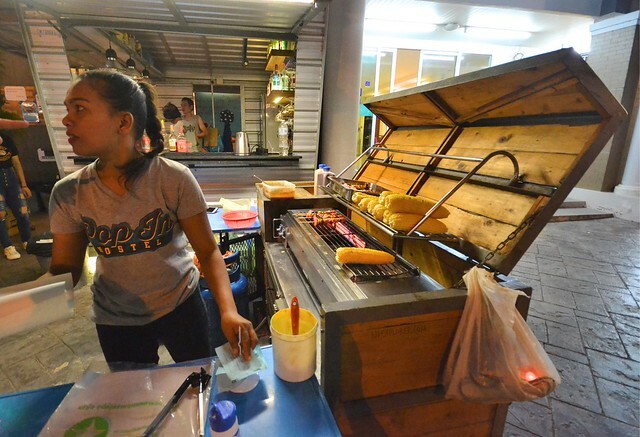 A breakfast shop, selling sandwiches, pancakes, and smoothies, is also across the road. A pharmacy and a convenience store are also within reach. 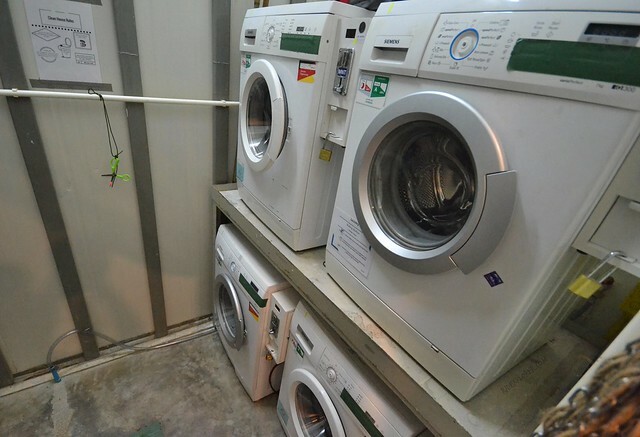 The hostel has its own laundry facilities if you need to clean those smelly clothes jammed inside your backpacks. Normal nights at Pop-in Hostel. Look at the giant Jenga blocks! Beer pong on the left.